It has now been over 20 years since I first saw and fell in love with the work of To, when he directed The Heroic Trio. Since then, he has delivered any number of quality works, such as Exiled or Vengeance, with hardly a misstep. If you want an indication of his talent, check out the 7-minute unbroken tracking shot that opens Breaking News. So why does this feel so… meh? I think it’s mostly because you spend a long time waiting for the steak to show up. There’s no denying, it does, in the shape of a hellacious hospital raid, largely unfolding without dialogue, which is approaching Prime To. The problem is, to reach this, you’ve got to sit through a lot of uninteresting chit-chat. 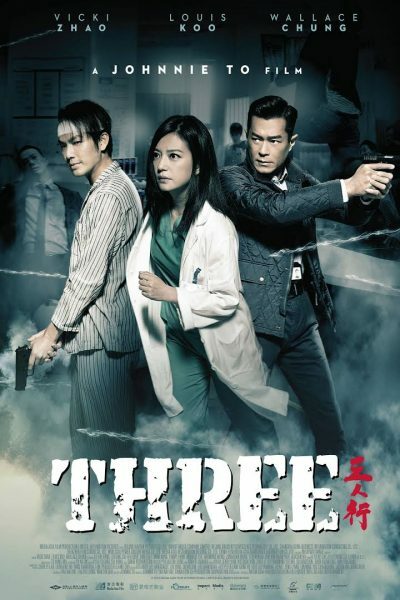 During a police operation, a suspected jewel-store robber, Shun (Chung), takes a bullet in the head, and is rushed to the hospital for treatment, while his colleagues scarper. 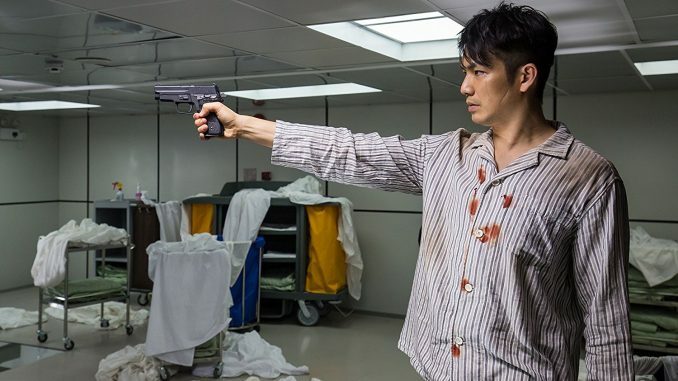 The circumstances of his shooting are somewhat murky, to put it mildly, and Police Inspector Ken Chen (Koo) has a vested interest in making sure that the truth doesn’t come out. Meanwhile, stoically defending Shun’s rights – to a phone-call, to treatment, and even the right to refuse treatment – is neurosurgeon Dr. Tong Qian (Zhao). The right to refuse becomes increasingly important, because Chen suspects Shun’s accomplices have a rescue mission imminent, which would be derailed by his surgery. So, the titular trio sit around for 70 minutes, trading barbs and Bertrand Russell quotes with each other, in a passive-aggressive version of a Mexican stand-off. It’s like Waiting for Godot – if Godot were a heavily armed gang of Chinese criminals, and had a POV shot of surgery from inside the subject’s head, for no obvious reason. Meanwhile, Shun appears remarkably chipper for someone shot in the head and, supposedly, mere hours from death, as he burbles on. I started to wonder if the cops had shot Shun in the head, in a futile effort to get him to shut the hell up. He’s annoying enough; this would likely fall into the “…and nobody saw anything” category of crime. Finally – and that’s exactly what I found myself saying, when it happens – things kick off, and we get one of those Johnnie To specials, with the camera and participants roaming the hospital in the rescue attempt. We’ve seen this kind of hospital-fu before in Hong Kong cinema, most obviously in John Woo’s seminal Hard Boiled. But even here, the incarnation is somewhat underwhelming, with a few of the participants looking as if they are pretending to move in slow-motion. An artistic choice, or an artifact of the CGI used to enhance things? The latter stands in disappointing contrast to the pure mechanics of the Breaking News shot, linked above. This all feels rather lazy in comparison, almost as if To was pulling a stunt attributed to fellow Hong Kong director Wong Jing, who allegedly would sit around reading the horse-racing section of the newspaper when “directing.” Definitely a disappointment.